The definitive final word on the world's greatest rock band, Led Zeppelin. 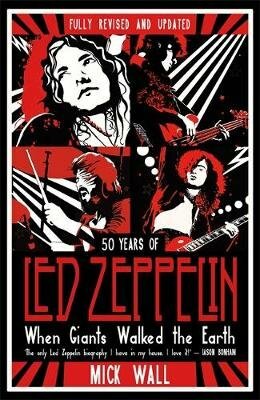 Over ten years after WHEN GIANTS WALKED THE EARTH, Mick's seminal biography of the band, comes this major and extensively researched revision, which will provide an unflinching look at life inside one of the biggest-selling rock bands of all time, and present the definitive, final word on Led Zeppelin. They were 'the last great band of the sixties; the first great band of the seventies'; they rose, somewhat unpromisingly, from the ashes of the Yardbirds to become one of the biggest-selling rock bands of all time. Mick Wall, respected rock writer and former confidant of both Page and Plant, unflinchingly tells the story of the band that wrote the rulebook for on-the-road excess - and eventually paid the price for it, with disaster, drug addiction and death. WHEN GIANTS WALKED THE EARTH reveals for the first time the true extent of band leader Jimmy Page's longstanding interest in the occult, and goes behind the scenes to expose the truth behind their much-hyped yet spectacularly contrived comeback at London's O2 arena in 2007, and how Jimmy Page plans to bring the band back permanently - if only his former protege, now part-time nemesis, Robert Plant will allow him to. Wall also recounts, in a series of flashbacks, the life stories of the five individuals that made the dream of Led Zeppelin into an even more incredible and hard-to-swallow reality: Page, Plant, John Paul Jones, John Bonham, and their infamous manager, Peter Grant.